Rogelio and Janet Huidobro opened the first Café Sevilla in 1987, honoring their homeland with a Spanish restaurant in San Diego’s Gaslamp Quarter. After finding additional success in Riverside, they launched in downtown Long Beach in 2006. Mid week, the old-world setting draws business types. Weekends attract a younger crowd for upstairs dancing and dinner shows. 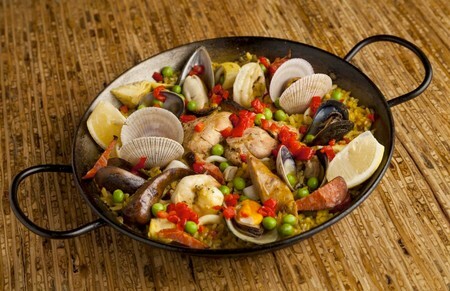 Café Sevilla specializes in pans of paella and traditional Spanish tapas. The reasonably priced wine list is especially strong on full-bodied Spanish reds like Tempranillo and Torre Oria. Rogelio and Janet Huidobro opened the first Café Sevilla in San Diego’s Gaslamp Quarter in 1987, naming their Spanish restaurant for “the cultural capital of southern Spain.” After enjoying success in Riverside and a five-year experiment in Carlsbad, the duo launched their concept in downtown Long Beach in March 2006, in the former home of Jack Rose steakhouse and martini lounge. 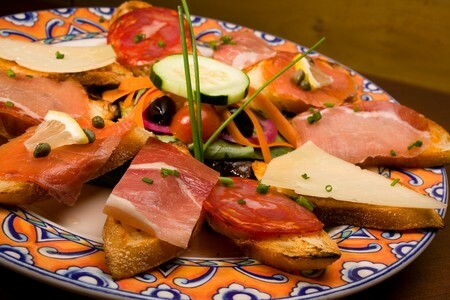 Midweek, businesspeople from nearby offices come to Café Sevilla for a laid-back lunch. 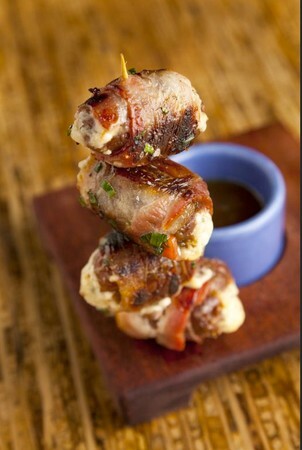 After work, people pop in for half-price tapas and a glass of Spanish wine. 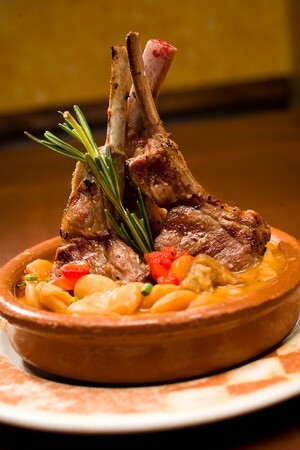 At nights and on weekends, a younger, high-volume crowd floods the restaurant to devour combination platters and to bathe in music from flamenco guitarists. Upstairs in the nightclub, Café Sevilla hosts weekend dinner shows and dancing. 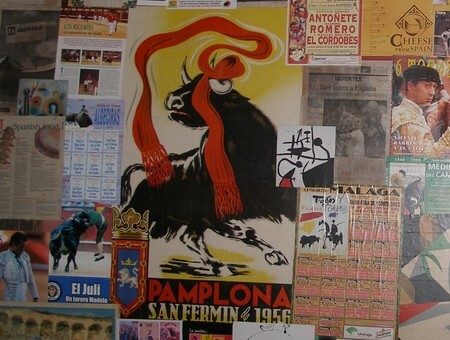 In an effort to integrate the Old World, the restaurant is populated with iconic Spanish images, including Miro paintings, vintage bullfighting posters, bulls’ heads and twin suits of armor. The bar area hosts high ceilings, a U-shaped wood bar, and complementary wood furnishings. A wrought-iron railing is designed to resemble vines, decorated with green and yellow stained glass “leaves.” Near the entrance, walls host more iron work, as well as bunches of stems tipped with fiber optics. In warmer months, a light-lined outdoor patio faces the sidewalk, bordered by more wrought-iron railing, sporting the letter S.
A stone-walled walkway leads to a lower-slung, red-walled dining room, which is lit with lanterns shrouded by dangling red beads. With mirrors on the ceiling, the lanterns cast a moody red glow. 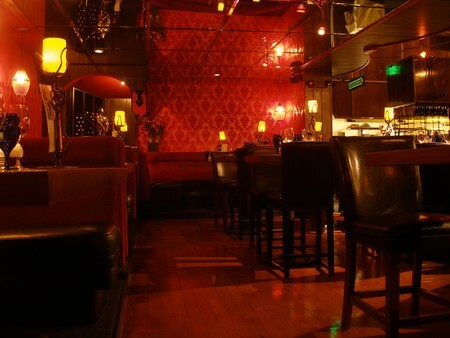 Sumptuous red booths form an L-shaped pattern, with wood tables in the middle. Each table hosts a funky-shaped wrought-iron candleholder and a stack of plates, so sauces from different tapas don’t have to mix. It was a good idea to start with a glass of sangria, made with red wine and bobbing with cubes of oranges, and both red and green apples. The fruits’ sweetness struck the perfect balance with the wine’s acidity. A wood plank held a fresh-baked loaf of Kalamata olive bread, crusty outside, warm and soft inside. The bread was served with a bi-partitioned dish containing marinara sauce and garlic aioli. The flavored mayo gripped the bread nicely, but the tomato sauce was thin, a lesser match for the olive bread. 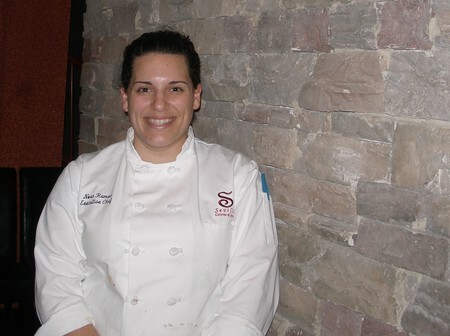 Chef Nora Ramos took the reins of the kitchen in October 2007 after cooking for three and a half years in Old Town Pasadena’s Bar Celona restaurant. She clearly has a firm handle on Spanish cuisine. An affordable way to sample three different wines is to order a flight. Any glass of wine on the reasonably priced list is fair game. The trio arrived in glasses stenciled with the orange Sevilla logo. The Veramonte Chardonnay from Chile’s Valle del Maipó was dry, sweet, and subtly spicy. Less successful was the Spanish Tempranillo from Marques de Arienzo in Rioja, which tasted acidic and carried a lingering bite. Redemption arrived in a glass of Miguel Torre “Santa Digna” Cabernet, from Chile’s Curico Valley, which was milder but well balanced. Café Sevilla’s menu designates certain items with a globe, indicating they mingle traditional Spanish ingredients and world cuisine. A successful example of this approach was the vertical Tuna Tartare. From the top down, the colorful tower featured julienned mixed greens, sushi-grade ahi marinated with soy and citrus balsamic vinaigrette, guacamole-like avocado, diced mango, diced tomato, and strands of crisp celery root. Ringing the colorful tower were drizzles of mint aioli and chive oil. The flavors melded well. Lamb Chops Madrileñas were marinated in rosemary garlic oil and grilled. The chops had a nice char and good flavor. They were cooked medium well, although I would have preferred the meat given medium rare treatment. The lamb was served over earthy fabada, large white Spanish beans that had been stewed with ham hock, chorizo, onion, and garlic. The dish was garnished with red pepper strips, a vertical sprig of rosemary and a sprinkling of minced chives. The Bocadillo Sampler hosted an array of Spanish meats and cheeses, all sourced from La Española Meats, a renowned importer of Spanish ingredients that’s situated in nearby Harbor City. The plate featured ten pieces of crostini slathered with garlic-tomato sauce akin to gazpacho. There were five different thin-sliced toppings. Jamon Serrano was dry cured pig leg, aged for 12 months, smoky and dry. Rosy hued lomo (ham) was chewy and garnished with chives. Soria was a chorizo from Bilbao, Spain, cured with Spanish pimento, giving it a deep red color. Silky smoked salmon was topped with chives and capers and a tiny lemon wedge, adding nice acidity. 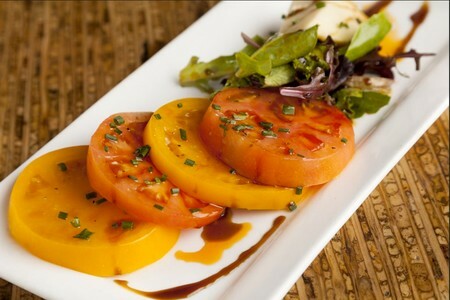 Manchego was a firm sheep’s milk cheese made in La Mancha topped with diced red bell pepper. In the center of the sunburst pattern of sandwiches was a house salad, mixed greens with citrus balsamic vinaigrette, strands of pickled onion, Mandarin orange slices and Kalamata olives, topped with a sliver of cucumber and half of a cherry tomato. The single serving of colorful paella Valenciana – Café Sevilla’s most popular dish - was still a feast, served in a twin-handled pallera. 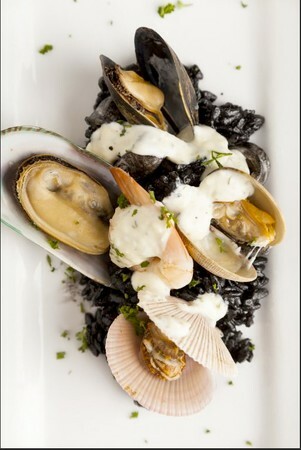 Saffron-infused rice was vibrant yellow, littered with sea creatures, including green lip and black mussels, Manila clams, calamari, shrimp, and “singing” scallops in their pink shells. There were also three varieties of sausage, including slices of chorizo and morcilla, dyed deep red from pig’s blood. The vegetable contributions were plump peas, cuts of red and green bell peppers, Spanish artichokes and squeezable lemon wedges that added a tart citrus tinge. The kitchen could have dialed down the saffron and taken the pan off the flame a little sooner to preserve the seafood’s texture, but on the whole, the dish worked. For dessert, Crema Catalan was similar to crème brulée, only infused with espresso. A crisp sugar crust cracked at the tap of a spoon, revealing a creamy cocoa-colored pudding that was luke warm. The crust was strewn with chocolate chips and garnished with a halved strawberry and a single mint leaf. For a dessert created off site, in Café Sevilla’s corporate kitchen in San Diego, it was solid. 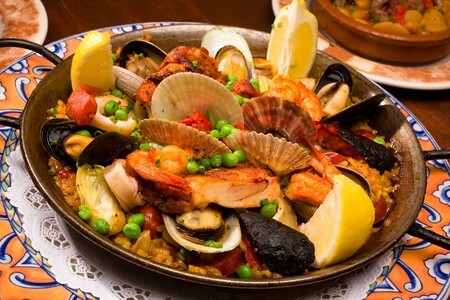 Overall, Café Sevilla managed to provide a convincing Spanish experience. The atmosphere was warm and inviting and the food comforting. Main Dining Room | Dinner 4:30 p.m. - 11 p.m.
Main Dining Room | Happy Hours 4:30 p.m. - 6:30 p.m.
Main Dining Room | Dinner 4:30 p.m. - 1 a.m.
What cities does Cafe Sevilla have locations in? 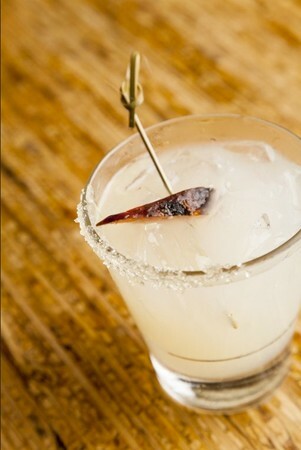 Cafe Sevilla has locations in San Diego, Long Beach and Riverside. 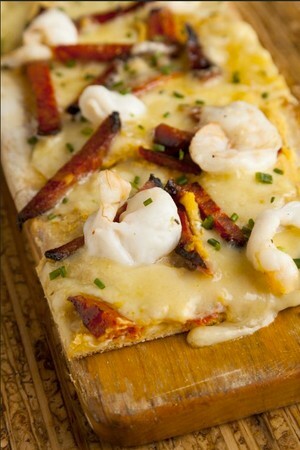 What days and times does your restaurant serve brunch? 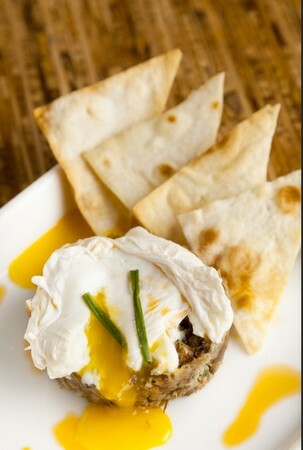 Cafe Sevilla Long Beach only serves brunch on Sundays, beginning at 10am. 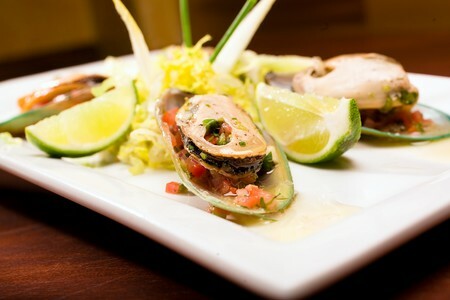 Does Café Sevilla in Long Beach have a delivery service for catering events? 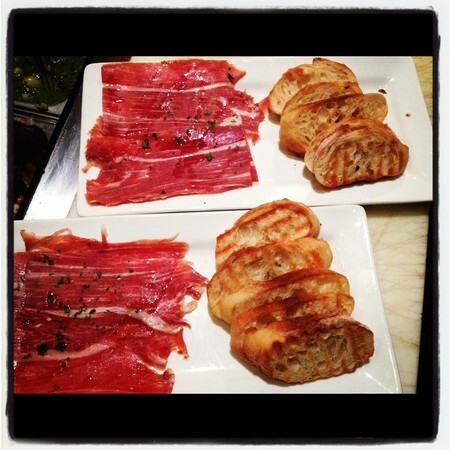 This legendary Jamon Iberico comes from black Iberico pigs native only to Spain. Sliced tableside! Homemade, original flans made with goat's milk. Sangria flan, Lemon Rosemary flan, and Goat Cheese flan. Add ice cream to any dessert. Stoli vodka with fresh squeezed lemon juice. Add Stoli Raspberry for a delightful Raz-Lemon drop! per person. 3-course menu. Price includes a two-part Flamenco Dance performance. Price does not include tax and gratuity. Reservations are required. Payment is required upfront and will be taken during the reservation process. Dinner begins promptly at 7:00 p.m. I recently celebrated my mothers birthday at Cafe Sevilla and we all had the best experience. I made reservations ahead of time, good thing because the place was packed! Our server was extremely sweet and had good suggestions for some of the Tapas, especially for a first timer! The Chicken Croquettas and Jerez Meatballs are so yummy! Our food arrived promptly, actually ahead of what we expected. The quality of the food was fantastic, such an intimate setting with delicious food. 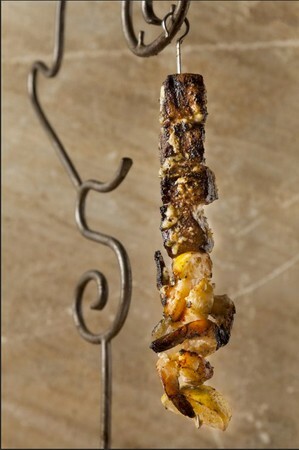 I even had my 7yr old daughter and a 12yr old with us and they seemed to love it, maybe it was how cool the shrimp and beef skewers looked hanging above their plates on this very unique contraption. I will definitely come again and recommend it to anyone who loves Spanish food. 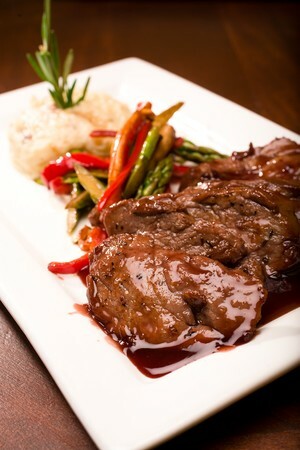 Try the grilled Salmon and the roasted pork tenderloin...YUM! The food was delicious. We loved the small plates. It gave us an opportunity to try several things. This restaurant proved to be worth the trip & money. 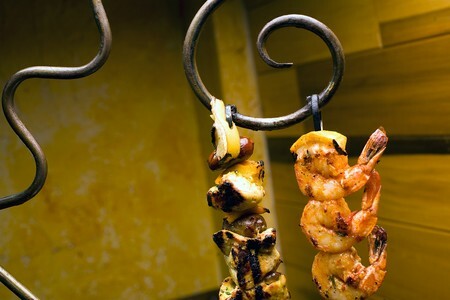 Located in a nice area of Long Beach, the food from Sevilla was top quality. 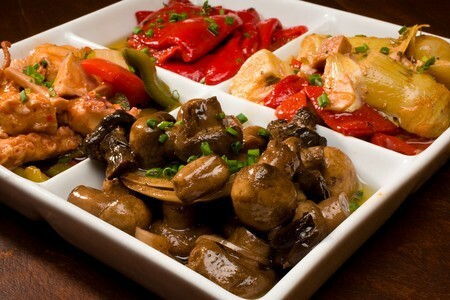 If you are looking for authentic spanish cuisine you will enjoy there variety of plates. Ambiance & mood are very LA....wine tasting a plus! The customer service was awesome!!! The food simply delicious and the waitress was very knowledgeable on the food, wine and beer!!! Will recommend to all and will most definitely be back again!!! Had a great experience. Food was exceptional and service was even better. Definitely recommend the restaurant. I will be coming back to enjoy the rest of the menu. Celebrated an anniversary @ Cafe Sevilla in LB. Had a excellent meal and memorable experience. 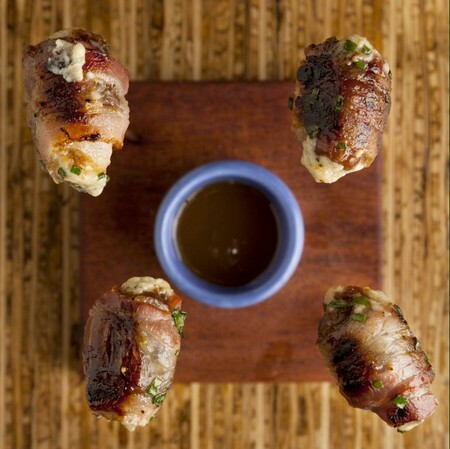 Great for special occasions but plan to make it a regular spot, the tapas are just too good. Ewww, this place is sooo Aweful!! The WORST restaurant I have EVER been to! The food is really small portion, super expensive, and taste is Aweful!!! The food was NOT even close to being good. It was the worst food in my life. So disgusting. Please, save your money!! I spent $200 on this place and walked out hungry... and a bit grossed out. and worst of all, there was a cockroaches crawling on my seat!!! I totally freaked out! This is the worst place EVER!